Arriving to Xian we expect a sleepy backwater type city, held in the past, not overly developed. What we find is the complete opposite. Xian is new, dynamic and exciting and while not as expected, what we find is in fact better. Xian is a city showcasing both China, old and new, authentic yet modern. It is also a city simple to navigate and cheap to enjoy (our guide to getting around in Xian). Many of our more memorable experiences weren’t the actual ‘Top Attractions in Xian’ but came in the uniqueness of local life, the early mornings in local parks, poking down backstreets in search of noodle shops and street food bites (our Chinese street food guide). The city is undoubtedly beautiful, albeit smoggy. In the end, we find ourselves rushing through each of the top attractions in Xian just to get back to enjoy the city, almost like a tick list. That being said, all the attractions are well worth the visit, and all should be visited. Here are our Top 5 Attractions in Xian, China. An easy start for attractions in Xian is the Bell Tower and Drum Tower, both found smack in the centre of Xian’s historical city centre (City Midst). This is the same area where you should base yourself for travel (City Midst Hotels here). Tourists rarely venture from the City Midst area and when they do it is travelling out to the other attractions in Xian (as below). So the Bell tower is very central and from it roads lead North, South, East and West to the coinciding city gates. Surrounding it is a busy roundabout which means for access to the Bell Tower you will need to enter from the subway below. The Bell Tour is hard to miss and to enter there is a small entrance fee. Circle the floors, explore the exhibits and take in the panoramic views of the surrounding city. From the Bell Tower you will see the nearby Drum Tower which sits on the west street opposite. The drum tower again can be easily reached a quick walk from the subway below. The Bell Tower and Drum Tower are the easiest of attractions in Xian to explore, it is best to cover them on the same day, then admire them on passing for the rest of the visit. Cultural performances also take place at both attractions during the day (the drum demonstration shown below) and Fanfan also took the opportunity to dress up in traditional dress (and look like a cartoon character). For the foodies and food lovers. The Muslim Quarter is again found near centre and it can easily be found backing onto the Drum Tower which sits next to the main street of Beiyuanmen. From here there is a seemingly endless labyrinth of street food, restaurants and bustling local life. The Muslim Quarter is no doubt a mecca for eating (Halal food being the obvious favourite) and it is one of the better places to find Xian’s signature dishes (here for our Muslim Quarter Food Guide) including the Chinese Hamburger (Rou Jia Mo; 肉夹馍), known throughout China, but originating from Xian. The iconic dish, however, must be the Mutton and Flat Bread Stew (Paomo Yangrou), a bowl of broth mixed with vermicelli noodles, slabs of mutton and broken pieces of pitta-like flatbread. Definitely worth the journey. The prominence of flatbreads in this area brings a welcome escape from the far-more-common rice dishes of China. The Muslim Quarter of Xian is buzzing from early morning hours, to late at night and dotted throughout you will find a number of other known attractions in Xian including the Great Mosque and the Gao Grand Courtyard and shadow puppet show. Xian and Shaanxi’s iconic dishes can also be found at the larger eateries and restaurants along the street (here for Xian Food favourites). The obvious ‘must do’ of attractions in Xian is the World Heritage site of the Terracotta Warriors. The location of the Terracotta Warriors is quite far from city centre, and while we’d normally travel independently, on this occasion we see few benefits and too many hassles. We instead opt for a cheap Terracotta Warriors Tour booking through our hotel to be squashed into a minibus. The main attraction covers three rooms, 3 pits, all with continuing excavation. Pit number 1 is the largest, and by far the most impressive of the three, so it will likely be covered last. 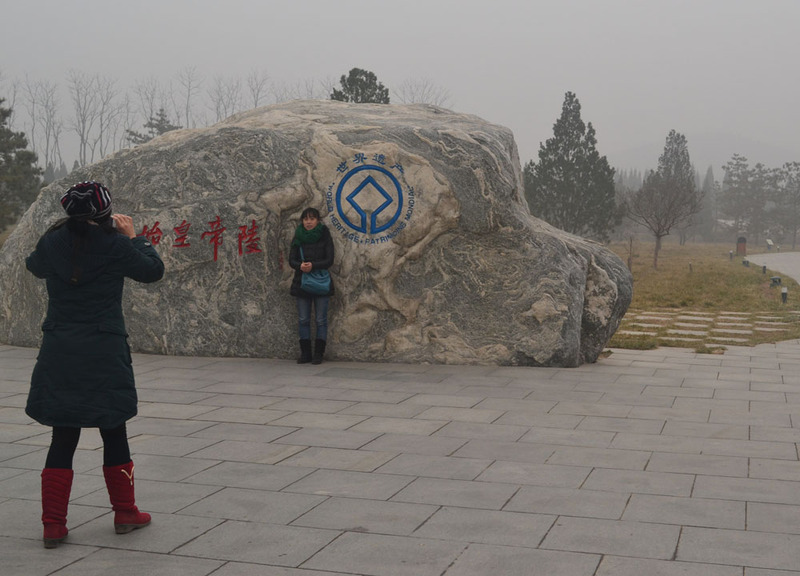 The ticket price also includes a 20 minute movie and a visit to the Mausoleum of the First Qin Emperor who originally built these warriors.The mausoleum is in fact built within a manmade mountain which will be seen in the distance, if the smog permits (we see a faint line). Also on our tour was a forced stopover at an overpriced trinket shop, and an authentic Chinese meal on the journey back to Xian city center. The entire trip takes a good half day, we’re on the road at 09.30 and back close to 17.00 hours (Check here for our full Terracotta Warriors experience). We travel to Big Wild Goose Pagoda in December, winter time, when the front fountains of the Pagoda are frozen and iced over. These fountains alone are said to be an attraction, lighting up and dancing at night, but we obviously miss this. Anyway, we arrive early morning which, for me, is the best time to explore attractions in Xian before the swarms of tours and buses flood to the gates. My real intrigue however comes with morning local life where the surrounding grounds of Big Wild Goose Pagoda come to life with morning exercise, games and other bizarre activities. Perfect for people watching as congregations of locals gather round small stereos to join in dance and exercise, each at their own pace; some lively, some serene; from Tai Chi with swords (Tai Ji Jian) to a weird back-and-forth dance with umbrellas and scarves. All the surrounding area is free to explore but to enter the actual pagoda grounds it takes a small fee (20Rm) and if planning to climb the Pagoda itself it will be 50Rm. To Big Wild Goose Pagoda we travel by subway which I don’t actually recommend (Xiaozhai Station (Exit C) walk right and take the first right at traffic lights and walk… for a good 10 or more minutes). Taxis are cheap in Xian and it was an easy ride back to the city center via the old city walls. Journeys into, and out of, the city centre will always pass the Xian city walls and a walk in any direction from the central Bell Tower will always lead to the city gates. The main attraction would be the trek along the top of these walls, following the perimeter of the city, and this is one of the attractions in Xian you can’t really miss. Not only have you a great vantage point view of the city but there are plenty of sites along the way to poke through. The full length of path covers roughly 14km and there are many options available for traversing it. The best entrance and starting point is always the South Gate where the entrance fee to the path is roughly 54 Yuan. Here you will find options of bike rental which (I think) was 40 Yuan / 100 Minutes (pp) and for couples there are tandems. For lazy people (like ourselves) there is a shuttle car service available for around 80 Yuan which takes roughly one and half hours to navigate the walls and stops only four times, at each city gate. There are four entry gates to Xian, North, South, East and West with each gate of similar in structure and layout. If you’ve seen one, you could more or less say you’ve seen them all. At the South Wall there are also cultural performances throughout the day but we miss out on our timing. Note, during winter it is cold up there.